BioGeoCheMix® is an advanced solid chemical composition (patents pending) that incorporates a complex suite of both organic and inorganic amendments. BioGeoCheMix® is designed for the anaerobic remediation and biologically mediated chemical reduction of extremely recalcitrant halogenated organic compounds such as DDT, toxaphene, and PCBs. 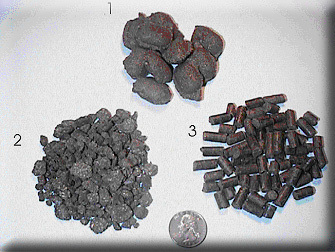 The value-added forms of BioGeoCheMix® such as pellets, granules, and briquettes simplify its application to contaminated soils and sediments. These forms are designed to sink in water and into aqueous sediments, enabling the remediation of difficult environments such as wetlands, rivers, lakes, lagoons and the like. BioGeoCheMix® works first via a solid-phase extraction process whereby hydrophobic contaminants partition to the particulate organic matrix of the product, thereby enhancing the bioavailability of the contaminants without increasing the risk of mobilization (as with solvents or surfactants). After exposure to water and environmental conditions, the organic matrix of the BioGeoCheMix® degrades, promoting co-metabolic contaminant biodegradation. The geochemical components of BioGeoCheMix® help optimize and maintain stable, low-Eh conditions to enhance chemical reduction processes, including biologically mediated reductive dechlorination. BioGeoCheMix® provides a sustained release of substrates, electron acceptors and nutrients to promote the growth of microbial consortia under anaerobic and reducing conditions. BioGeoCheMix® is applied as  briquettes,  granules and  pellets to treats soils and sediments in lakes, rivers, lagoons and other difficult environments. 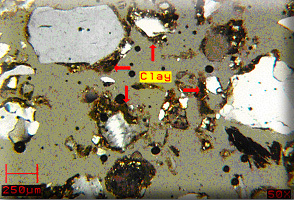 Micrograph shows pesticide coatings (clay) on a sand-sized soil grain. The low bioavailability of these NAPL like pesticides poses a considerable challenge to bioremediation. BioGeoCheMix® was developed to overcome this problem to promote effective bioremediation. BioGeoCheMix® emerged from extensive field and lab trials. Treatment half-lives of less than two weeks were achieved for both DDT & toxaphene in lab trials (above) en route to the development of BioGeoCheMix®.